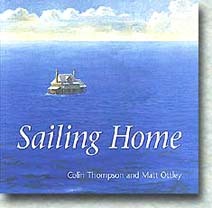 Sailing Home was published by Hodder Headline Australia in November 1996. The illustrations are painted in oils by Matt Ottley an artist/illustrator and composer. Matt's other titles include What Faust Saw which he both wrote and illustrated. When Peter's family wakes one morning to discover their house is adrift in the middle of the ocean, it is the start of a wonderful adventure . . . When the circus where Oscar the Clown has lived all his life closes down, he sets off through the countryside to find his best friend, Rosie the elephant. . .
Wild animals should be in wild places. 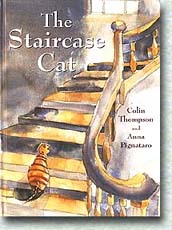 The Staircase Cat was published by Hodder Headline Australia in July 1998. It is beautifully illustrated by Anna Pignataro. Oskar the cat has lived with the caretaker and his family for as long as he can remember. Then one day war comes to the city where they live. Bombs fall, tanks rumble along the streets, and everyone begins to disappear. Surrounded by ghosts, Oskar waits in the deserted building for the people to return. Many years pass and the town gradually returns to life, but there is no sign of Oskar's family. Until one day, a young woman walks into the old building . . . 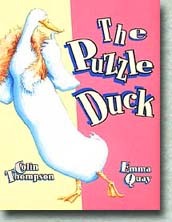 The Puzzle Duck was published by Random House Australia in 1999. It is illustrated by Emma Quay who like me is from England, married to an Australian and now living in Australia. The Puzzle Duck is always answering questions and has become a bit of a guru. But her advice is more imaginative than accurate! She tells her sister that the trick is to believe the answers yourself even if they're not true. They will make people happy. The Puzzle Duck may outwit her sister but when a fox comes to her pond, she would certainly lose her life if it weren't for the truth being there to save her! The Puzzle Duck has also been published in Korea. 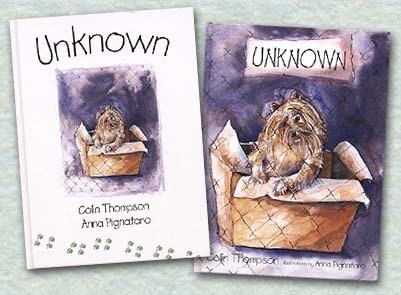 Unknown was published by Hodder Headline Australia and Walker Books in the U.S. in March 2000. It is illustrated by Anna Pignataro. The left picture is the Australian cover. The right picture is the American cover. Anna and I both like the U.S. cover best. When a ferocious fire breaks out at the dog pound, it is the smallest and most unwanted dog who saves the day. Unknown has also been published in Korea. 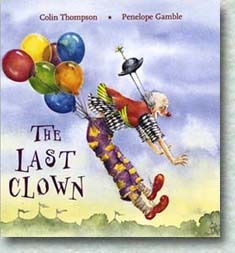 The Last Clown was published by Hodder Headline Australia in July 2001. 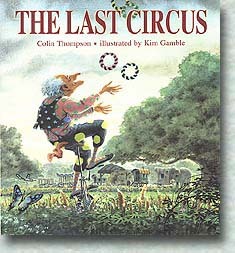 It is illustrated by Penelope Gamble (Kim's sister). Zippo the clown is the oldest person in the circus. When he retires, there will be no more clowns to follow him. Then something happens to Max the circus's youngest tightrope walker, something that makes sure there will always be clowns to make the world laugh. 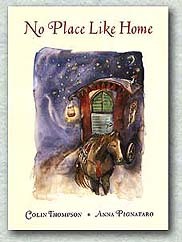 No Place Like Home was published by Hodder Headline Australia in October 2001. It's illustrated by Anna Pignataro. Every summer, Big Jim pulls the caravan that takes Max and his family around the countryside so they can perform their acrobatics and magic theatre show. Big Jim is happy making everyone happy, but he's getting old and all he really want to do is stay in his green field by the river. For Jim knows that the best thing about going away in going home again. 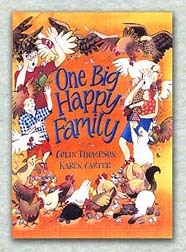 Then Max and his family arrive at a one-horse town . . . .
One Big Happy Family was published by Hodder Headline Australia in March 2002. It's illustrated by Karen Carter. When a young boy moves with his family to a new house, he think's it's just him and the family. He doesn't count on the spiders, the frog, the ants, the mice, the anteater, the dog, the fleas, the cat etc etc etc . . . . 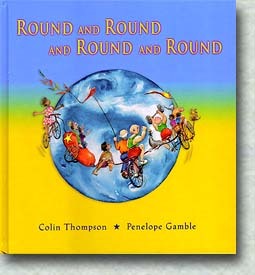 Round and Round and Round and Round was published by Hodder Headline Australia in May 2002. It is illustrated by Penelope Gamble. When Mrs Golightly retires, she buys a bike and sets off round the world. . . .
Gilbert was published by Lothian Books Australia in September 2003. It is illustrated by Chris Mould from the UK. Gilbert is the world's most nervous cat who is even scared of his own reflection in the mirror. The only place he feels really safe is inside a brown paper bag. 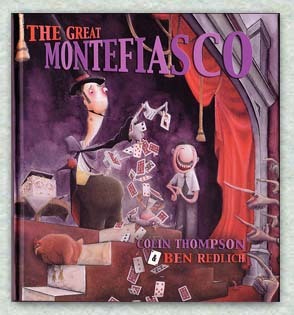 The Great Montefiasco was published by Lothian Books Australia in March 2004. It was illustrated by Ben Redlich. The Great Montefiasco is the worst magician in the history of Magic. Then he takes on an assistant - The Fabulous Betty - and his whole life changes . . . 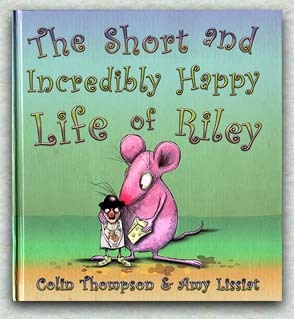 The Short and Incredibly Happy Life of Riley was published by Lothian Books Australia in May 2005. It was illustrated by Amy Lissiat. Humans live for a long time and a lot of that time we are not very happy. Rats, however, live for a short time and are happy all the time . . .
Riley WON the 2006 CBCA Picturebook Of The Year. 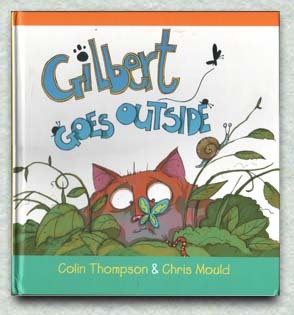 Gilbert Goes Outside was published by Lothian Books Australia in September 2005. 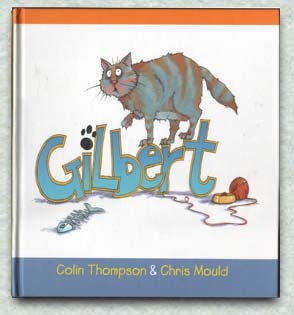 Like the first Gilbert book, it was illustrated by Chris Mould. Further adventures of Gilbert the world's most nervous cat who's Mum takes him to the most scary place he has ever seen - the garden. 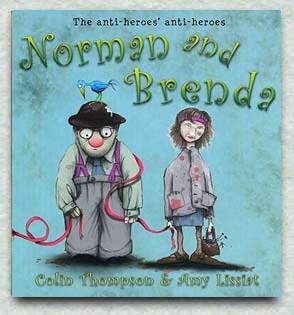 Norman and Brenda was published by Lothian Books Australia in August 2006. It was illustrated by Amy Lissiat. Some people face the world with confidence. They are popular, charismatic, incredibly successful and often beautiful. They achieve these things by sheer determination, talent and cosmetic surgery. They have big houses, big cars and big hair. Norman and Brenda are nothing like these people . 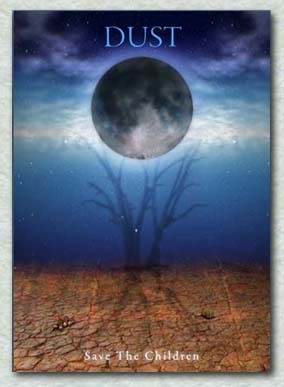 . .
DUST was published by ABC Books Australia in May 2007. I wrote DUST to raise money for SAVE the CHILDREN and 13 other illustrators each did an illustration. 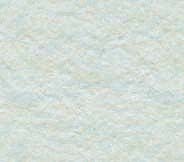 DUST won Honour Book in 2008's CBCA Picture Book of the Year Award. I don't know what the total amount raised was but it was over AU$250,000. When a new baby is born it’s difficult to tell if it will grow up to be big or small or brave or scared. So sometimes babies get the wrong name. It’s the same with dogs. 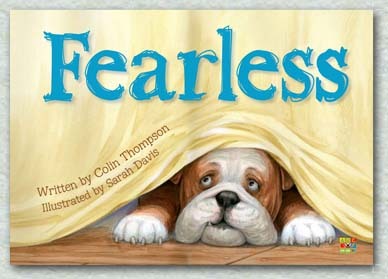 Fearless is a clever boy! He has won FIVE awards. CBCA Junior Judges Children's Choice Award. Fearless in Love came out On Valentine's day 2012 and won three awards. It was followed by Fearless Sons and Daughter in 2013. 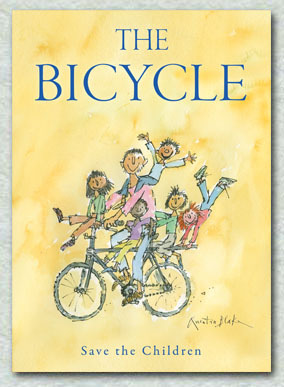 THE BICYCLE was published by ABC Books Australia on Septembe 1st 2011. It's the second book I've organised to raise money for SAVE the CHILDREN and has 15 different illustrators including Shaun Tan, and look who has done the cover - Quentin Blake! Unlike DUST which is a very sad book, THE BICYCLE is a happy celebration.